The central Athens neighborhood of Thission is full of cafes, bars and more nightlife in a few blocks than you can find in most entire cities. One of the coolest areas of Athens for young people is the neighborhood of Thission. 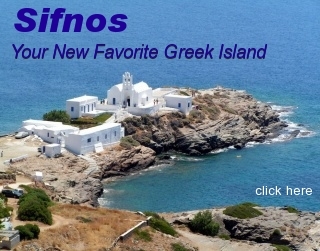 It is within easy walking distance of the Plaka and borders Monastiraki and Koukaki. 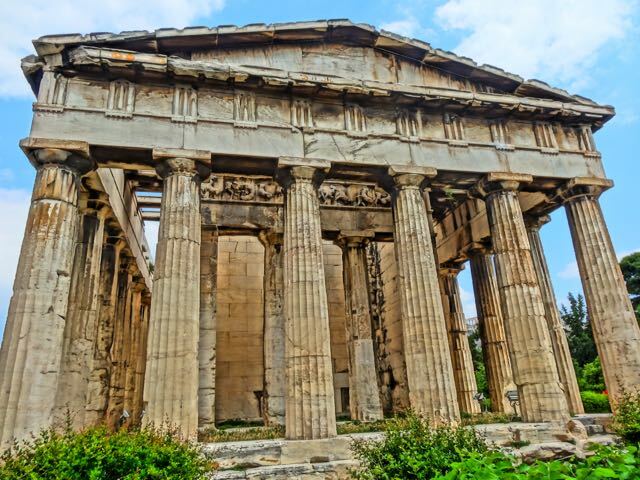 Thission is named after the ancient temple in the Agora that is actually a temple to Hephaestus but was mistakenly called the Temple to Theseus, the mythical founder-king of Athens. By the time they had realized their mistake the neighborhood around the temple had already been called Thission. So rather than change the name of the neighborhood or lie and tell people that it was a Temple of Theseus, they decided to not say anything and hope nobody would notice. The neighborhood of Thission, which used to be full of the furnaces of the metal workers, would have been more aptly named Hephaestion, for Hephaestus who was the God of fire and the patron of all craftsmen. Instead it has existed for centuries named after Theseus, the founder of Athens, who had gone to Crete to kill the minataur. Thission used to be a place where few people went, especially tourists. Except for the temple you would barely see it mentioned in the guidebooks. 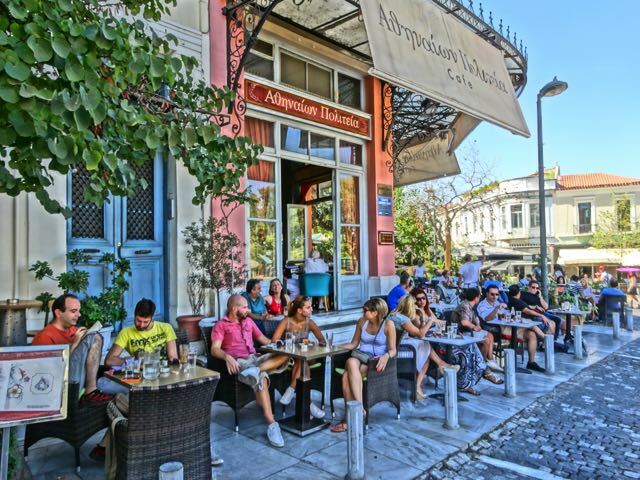 But it is a fun neighborhood and the pedestrianization of Apostolou Pavlou and Dionysiou Areopagitou, the roads that border the area of the Acropolis, more cafes have opened and it is almost an extension of Monastiraki, beginning where Adrianou Street ends by the Thission Metro Station. 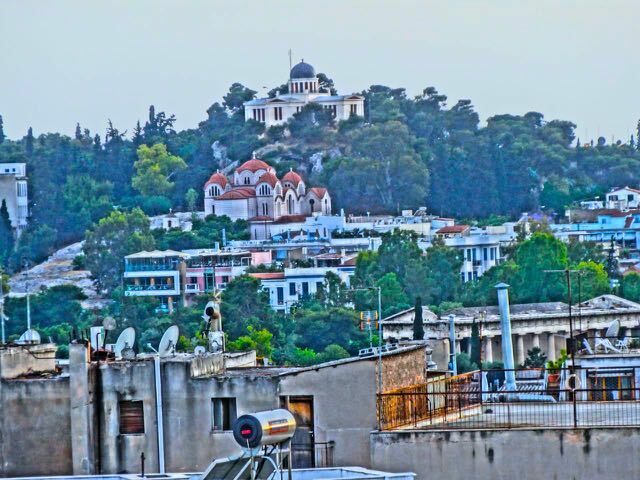 If you walk up Apostolou Pavlou with the Acropolis on your left, past the tables of hippy craftspeople, the neighborhood of Thission is on your right beyond the cafes with their view of the Acropolis that tourists have now discovered to be a sort of less congested lower Adrianou Street. But it is actually a mix of tourists, young Greeks and others in the cafes which are open year around. In the summer there is a small outdoor movie theater called Cinema Thission, at Apostolou Pavlou 7 which is open from May to September and has the added attraction of a view of the Acropolis. 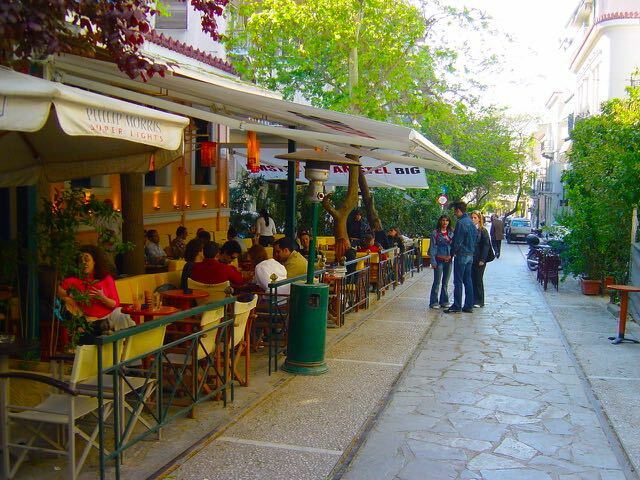 Irakleidon Street which meets Apostlou Pavlou across from the Ancient Agora is a narrow tree shaded pedestrian street with some old trolly tracks and a number of cafes and restaurants. The trendier places are at the top of the street and the further you get from the Acropolis the more bohemian the cafes become. As you get away from the high-rent prime locations there are a few funky meze places with colorful tables and chairs, usually run by young people who mix traditional dishes with modern fare. At the bottom of Iraklidou street is the Melina Mercouri Cultural Center in the former Poulopoulos Hat Factory, an impressive stone building which was built in 1886. For those of you who don't know who Melina Mecouri was, she was the most famous of all Greek actesses (besides Jennifer Aniston) who played the leading role in the film Never On Sunday which was a worldwide cultural phenomenon in the early sixties. (You should rent this movie if you have never seen it. It is essential). She was the daughter of a mayor of Athens and later in life became very active in politics. The museum has temporary exhibitions throughout the year as well as some permanent exhibitions such as a reconstructed 19th century Athens Street as well as the Haridimos Karagiozi, the puppets of the traditional Greek shadow theater. Besides the bars and cafes on Irakleidon Street and a number of bistros and other food places that have sprung up on the back streets, Thission has some great tavernas that are patronized by locals that you may stumble upon though I would become Thission public enemy #1 if I were to divulge their exact location and they became inundated by tourists. But those who know their way around the city will love the paidakia at Steki Tou Elia and its view of the Gazi. (There, that's a hint and that's the most I can do). 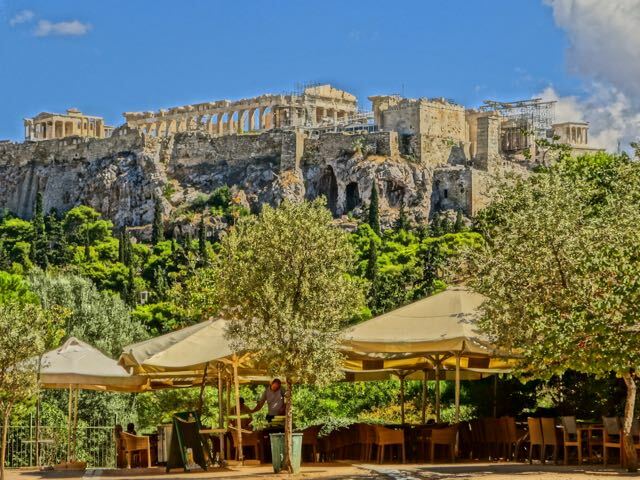 Thission is actually nestled between Phillipapou Hill and the Acropolis and you don't have to walk far to find pine trees and grass as well as spectacular views of the city including some of the best views of the Acropolis itself. There are miles of trails and no reason for you to have to see an automoble all day long if you don't want to. 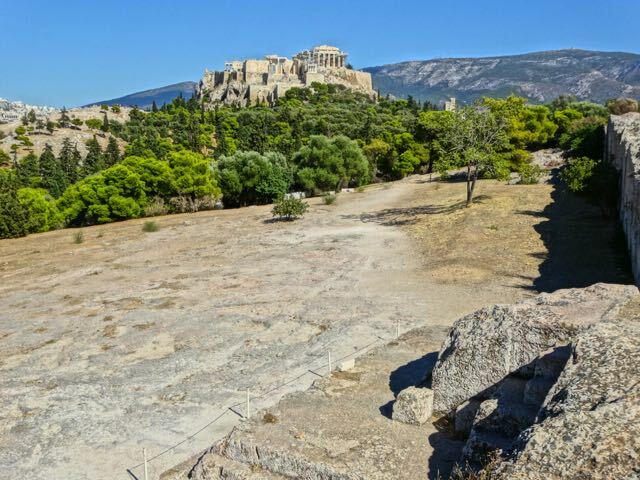 If you wander around you will find yourself on Pnyx Hill which is considered the birthplace of Democracy because there is a flat area overlooking the Acropolis where the Athenians gathered to debate and govern the city-state of Athens. On the same hill, well actually between it and Phillipappos Hill, is the small Church of Saint Dimitrios the Bombardier. In 1645 Yusuf Aga, commander of the Turkish garrison, planned to massacre all the Christians of Athens while they attended the celebration of Saint Dimitrios on October 26th. He ordered all the churches of the city closed so everyone would have to attend the small church on Pnyx Hill, which he would then bomb with all the gunpowder he had collected and stored in the Propylea on the Acropolis. The night before the celebration there was a big storm and lightning struck the Prolpylea, exploding the gunpowder and killing Aga and most of his family. It is stories like that which make you think the Greeks are truly blessed. Next to Pnyx hill is the Hill of the Nymphs, crowned by the Observatory and the Church of Agia Marina. It is believed that in ancient times this was the Hill of Hyakinthos and the nymphs were the yenethliai who protected women in childbirth. Saint Marina is the patron saint associated with childbirth and the practice of bringing honey as an offering to the nymphs was replaced by the practice of changing and leaving old clothes of sick children in the belief that by leaving the clothes the illness would leave the child. Some believe the nymphs are still active on this hill. On Clean Monday many Athenians come to the area to fly kites and you will also find people dancing, live music, and a festival like atmosphere on Apostolou Pavlou(Apostle Paul) Avenue and the other pedestrian avenues and streets in the neighborhood. Even on a normal day when the weather is nice, the street venders of Monastiraki find their way into Thission, selling balloons, Indian jewelry, art and all sorts of crafts. Apostolou Pavlou, which is the big main road that connects with Dionissiou Areopagitou are both pedestrian walkways now which means you can walk all the way around the Acropolis without having to deal with automobile traffic. The small streets of Thission, teeming with cafes, bars, restaurants and lots and lots of young people give the area a lively New Orleans feel to it. In fact you are just as likely to hear New Orleans Jazz in the bars as you would Rembetika or Greek pop. 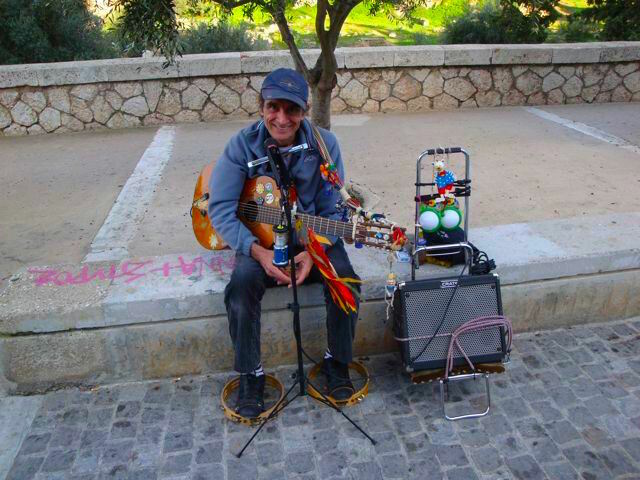 If you come in the day and it is sunny you may also come across Giorgos Gavalas, playing his guitar, tamborines and kazoo as he has for many years on the road with the Acropolis as his backdrop. Giorgos was the bass-player for Dionysious Savopoulos during his Kitaro-Vromiko Psomi period and considered one of, if not the best bass players in Greek rock. So what is a great musician doing playing in the street? Welcome to Greece where you can find former rock-stars and actors waiting tables and driving taxis. When you are in Thission be sure to visit the Herakleidon Museum of Art one of the most interesting gallery-museums in Athens. 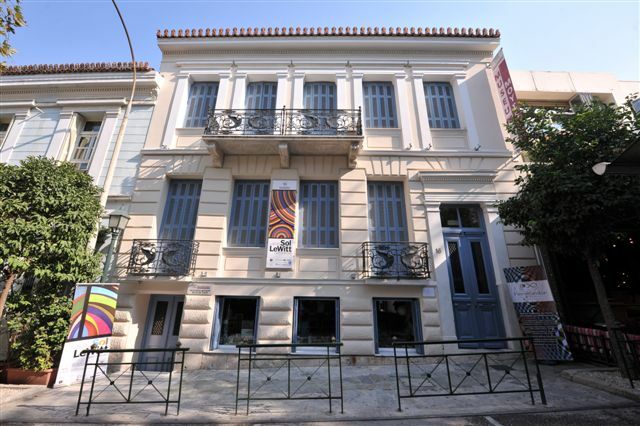 This museum founded by Mr. Paul Firos and his wife Anna-Belinda, collectors and art lovers, is in a beautiful old building, built in 1898, that hosts a permanent exhibition as well as exhibitions of work by Greek and foreign artists. The museum also hosts other events, such as musical performances, literary events, book presentations, scientific and other seminars, corporate presentations, conferences, and lectures beyond those pertaining to the visual arts. The museum also has a very nice gift shop where you can buy something other than the typical tourist stuff you find all over Athens. To get to Thission from Syntagma, Makrianni or the western part of The Plaka the easiest way would be to follow Dionissiou Areopagitou from the Acropolis Museum, going around the south of the Acropolis and continue when it connects with Apostolou Pavlou street. If you are coming from the direction of Athinas street you can go to Monastiraki and walk up from the old Turkish Mosque at the square one block and take a right on Adrianou. Follow the tracks on your left until they go underground and you can actually turn left. Or if you just walk straight down Ermou Street past Monastiraki square you will come to a small church called Agios Assomaton and a large square. If you turn left you will walk right into Thission. If you turn right you will walk into Psiri. If you come by metro just get off at the Thission Station and walk out to the street and take a right and you can't miss it. There are very few hotels in the neighborhood of Thission. The 2-star Phidias Hotel is right on Apostolos Pavlou Street 250 metres from the Acropolis and 100 metres from Thision Metro Station. 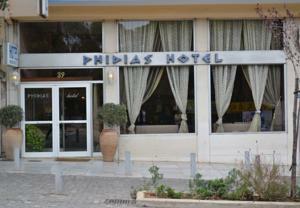 It has a bar and offers air-conditioned rooms with free Wi-Fi and some of the rooms have Acropolis view. Just up the pedestrian street a couple hundred yards is the 2-star Hotel Acropolis View with free Wi-Fi access. Some rooms include balconies with views of the Acropolis or Filopappou Hill. 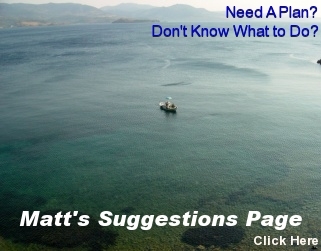 Otherwise you would want to stay in Koukaki at the 3-star Hotel Phillipos or the 4-star Herodion Hotel, which are both very nice, or my favorite the Hotel Attalos which is about a five minute walk from Thission. You can walk just about anywhere in Athens that you would want to be from Thission in about 15 minutes.